Solar Driveway Light in Canada and U.S.
Driveway Parking Light with Remote Control Operation! Remote control operation with lots of options. 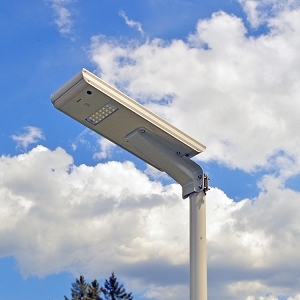 Lights up to a 60' wide rectangle of light when mounted at 11'. Ships fully assembled, only requiring the mounting brackets to be installed on your post. Mounts easily on any post from 2.5" to 4" diameter with supplied mounting hardware. In true free-light fashion, there is NO trenching and NO long runs of electrical wires are required. Did we mention all the solar lighting modes? 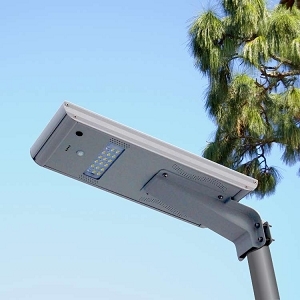 Your new Ra60 Wide Beam Year Round Solar Driveway Parking Area Light can be set for brightness, time, and motion depending on your specific needs. It also has a security light option, LED on/off, economy mode and timer operation. It's time to take solar savings seriously! Check out all the money-saving, hassle free, solar lights by free-light in our catalogue. When is the best time to brighten up the night (and your driveway) without spending money on sky-rocketing electricity? Right now!